The beaches and waters at Destin, Fort Walton Beach and Okaloosa Island are open, said Mark Bellinger, director of the Emerald Coast Convention and Visitors Bureau, which represents the three destinations. "We're expecting the oil sheen, if the winds continue from the south ... we're expecting the oil sheen to hit our beaches sometime this week," Bellinger said. "Now, if the winds change, then it will keep it offshore, and right now it's about four miles offshore," he said. "We haven't seen any tar balls since last week, which is good." The City of Orange Beach is flying double red flags, meaning the waters are closed to the public. The Alabama Department of Public Health has issued an advisory against swimming in waters off Gulf Shores, Orange Beach and Fort Morgan or in bay waters close to Fort Morgan, Bayou St. John, Terry Cove, Cotton Bayou or Old River. 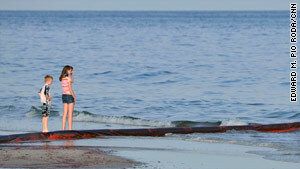 The beaches remain open for sunbathing and walking, the visitors bureau site said.